Welcome to day two of Post-Apocalypto-rama-rama at the Blogorium. 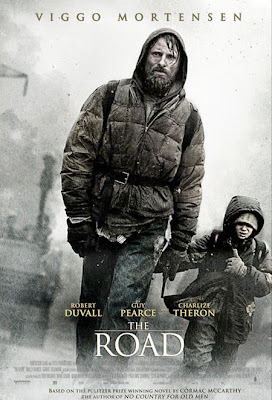 Today the Cap'n will be giving you my thoughts on John Hillcoat's adaptation of Cormac McCarthy's The Road (adapted by John Penhall), and starring Viggo Mortensen, Kodi Smit-McPhee, Robert Duvall, Guy Pearce, and Charlize Theron. What Caused the Apocalypse: We're not sure. There's never a clear answer given in the film (I'm looking at this separately from the novel), but it seems to be ecologically related. The trees start dying, animals die off, and society falls apart. The water has a brownish-yellow hue, and based on what The Father (Viggo Mortenson) says, there's not much life left, and everything is slowly dying out. Adverse Effects on the Population: The weather has become erratic and the sun seems to have vanished. Pretty much anything edible is gone, and staying warm is almost as critical as staving off starvation. When it's not raining, there's a good chance of anything around you collapsing. How Is Society Adapting: Society is practically nonexistent. Survivors have resorted to cannibalism, even the well organized groups. Women and children seem to be a very popular delicacy, at least according to the limited contact our heroes have with others. More than once we're exposed to evidence of people being slaughtered and eaten, or (in one case), being locked in a cellar to be eaten later. Those that don't eat other people have no problem stealing or attacking others, and frequently accuse anyone in the vicinity of following them. Our Hero(es): The Father and his Son (Kodi Smit-McPhee). Mortensen is dealing with the suicide of his Wife (Charlize Theron), who we see periodically in flashbacks. The Son was born after the apocalypse and is the only thing keeping The Father hanging on. He wants his son to represent the goodness left in humanity, and struggles with the fact that he may have to kill him rather than be captured or corrupted. Who's Standing in the Way: Pretty much everybody. If there's another human being in the film, they can't really be trusted; from The Old Man / Ely (Robert Duvall), who may or may not have murdered his own son, to roaming cannibals and the Thief (Michael Kenneth Williams) who takes everything while the Father is away searching a ship. There isn't anyone that can be trusted in this world, especially when you're the only "good guys." So What's so Important About Where They're Headed: In one of the flashbacks, the Wife makes it clear that "you won't survive another winter here," which seems to be somewhere in the northeastern U.S. They're headed to the coast, and then following it south, in the hope that they find anybody or somewhere safe to stay. Even though they discover a bomb shelter that's very well stocked, the Father and Son abandon it out of fear that they're being followed. How Well is the Post-Apocalyptic World Conveyed: Very. John Hillcoat took all of the desolation and foreboding of the Australian outback in The Proposition and turned it into an oppressive, grimy, abandoned world of post-apocalyptia. The film is caked in grays and washed out imagery, punctuated (and juxtaposed) with bright, colorful flashbacks of the world "before." There's not a moment in The Road that allows audiences to breathe, even when they settled down in the bomb shelter for a spell. Every place they go, from towns to countryside, seems wrecked and unpalatable as a place to stay, and the safe haven of an abandoned car doesn't last all night. So, Glass Half Full Post-Apocalypse, or Glass Half Empty? : I know that people are going to say "half full," because the underlying theme is of keeping "the fire" inside of the Son lit, but I'd say that the film ends on a note of ambiguity. When the Son meets the Soldier (Guy Pearce) and the Final Woman (Molly Parker) to join their "children," it's really unclear that they're really the hope we've been waiting for. There's enough question (particularly the way that Pearce behaves in describing the other children and how they know about Smit-McPhee and Mortensen) that I wonder how safe he really is, and there's a shot of the other two kids that really gave me pause. Admittedly, it's probably a more hopeful ending than what immediately precedes it, but there's some doubt in my mind how things go from there. The Road is a very well made film with an incredibly bleak tone that's not going to appeal to everyone. If you have any problems with serious child endangerment or fundamental concerns about seeing a world where humanity cannot be trusted, even in the most benign circumstances, then this probably isn't for you. I'll say that it wasn't as hard to watch as the novel was to read, and the trailers do set you up to think Theron's role is larger (or even more upbeat) than it actually is. The reality is that you spend most of the movie watching a terrified Mortensen trying to adapt to the environment while Smit-McPhee is asserting himself more and more amidst the reality that hope is a distant possibility. I like that Viggo isn't some kind of super-badass; he's just a scared guy that doesn't know if he can do the really hard things he'd have to do when the time came. That sense of terror and pushing on because there's no other choice really stuck with me. The tiny supporting roles all make a strong impression and I'll certainly revisit the film at some point in the near future, but it's not light entertainment by any means. Then again, the great films shouldn't need to be.